Are the Lip Typhoons the best polarized sunglasses for watersports on the market? When it comes to finding the best watersports sunglasses, the struggle is real. 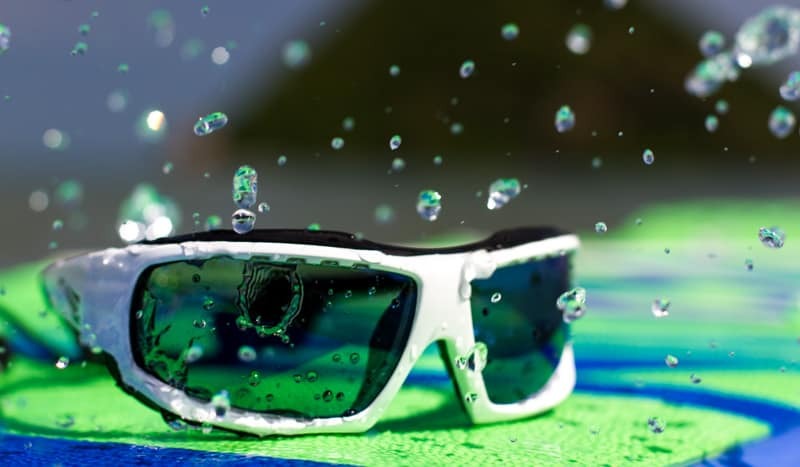 From the spray and salt that’s inevitably getting splashed in your face to the sweat that’s pouring out of you, it’s safe to say that watersports sunglasses take a beating. While there are TONS of watersports sunglasses out on the market, most of them come with a hefty price tag but lack the quality to match it. I’ve been left wanting after many a sunglass shopping spree. Alright, let’s do an exercise- just for funsies. If you could design the best watersports sunglasses, what would they be like? Disclosure: This page contains affiliate links, meaning that at no additional cost to you, we earn a commission on the sale of these products. Goes without saying, we only recommend products that we trust 100%, know you’ll love, and/or use ourselves. First of all, anti-fog is a must. Nothing worse than losing sight of what you’re doing because you’re lenses are getting all steamy. Speaking of lenses, they should also be polarized so that you don’t end up getting completely blinded by the glare bouncing off the surface of the water (which is a massive, massive issue for water sports athletes). Wave riders, sailors, or hydrofoilers need to read the water’s texture in the clearest way possible. Having possibly the best polarized sunglasses in front of your eyes out there is definitely a game changer. They’d also need to fit perfectly, feel comfortable, and having some little grippy bits on the nose area would be a big plus. And because I’m the sort of person who loses EVERYTHING (expensive things seem to disappear especially quickly, hence why I was still using a brick of a Nokia phone in 2015 while everyone else was knee deep in iPhone-land), my version of the best watersports sunglasses would have some kind of system to keep the buggers on my head- even when I crash big. They’d also need to be really, really good looking (duh). Do I ask too much? I don’t think so. But to be fair, that’s quite a few boxes that need ticking. No real surprise that I’ve never been able to find my perfect pair of watersports sunglasses… That is, until I started wearing LiP. LiP Sunglasses is a Taiwan-based brand specialized in creating the best watersports sunglasses for sports like kitesurfing, windsurfing, SUPing, sailing, and angling. 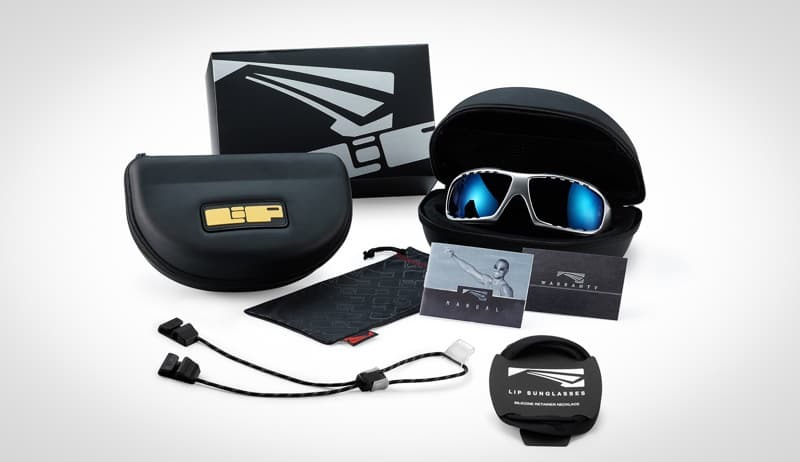 Their sunglasses are sold worldwide and are worn by tons of professional water sports athletes, including pro kitesurfers Lewis Crathern and Sam Medysky, windsurfing legend Taty Frans, or even the Youth America’s Cup sailing team, Spanish Impulse. So far, they have 2 best-selling watersports sunglasses as well as 8 other designs in their stylish urban collection. They’ve also recently brought out a range of prescription watersports sunglasses. Needless to say, we’re totally in love. Pssst: if you’ve also been looking for some everyday sunglasses for off the water, read our latest review of LiP’s Urban collection! Here’s why we think these are the best watersports sunglasses, maybe ever. LiP’s watersports sunglasses are made from primo materials, which is abundantly clear the second you pick up a pair and give them a feel. From the overall weight to the texture and finish, they just feel good. What’s more, they look good too. Now DON’T have a go at me for going on about looks when “it’s not the looks that matter, it’s the quality”. Ra ra ra… I had enough flack from the person who sold me my first set of kitesurfing gear (“don’t you have any…prettier ones?” was apparently not the right question to ask). Seriously though, these are good lookin’ shades. These watersports sunglasses are designed by people who live, eat, and breathe adrenaline sports. The Typhoon designer was a windsurfer, while other team members do sports like kitesurfing, surfing, SUPing, sailing, and paragliding- so you know that each pair of sunglasses will have passed rigorous standards in terms of design, functionality, and quality. Their watersports sunglasses are extremely durable, scratch-proof, fog-proof, heck- LiP even say themselves that they’re practically bombproof! Remember my list of must-haves for the perfect pair of watersports sunglasses? The Typhoon ticks every. Single. Box. I’ve been wearing Typhoons for 3 years now, and honestly, I can hands down say they’re the best watersports sunglasses that I’ve ever owned. The Typhoon have super high quality ZEISS polarized lenses, in which the polarization is actually injected into the lense itself- so you won’t have any issues with the coating peeling off or getting damaged after just one season of use. This is a huge plus for anyone who’s ever known the utter travesty of having to fork out 200 bucks for a new set of watersports sunglasses year after year (uhhh… me). Thanks to the fancy pants ZEISS injection, we reckon these are easily the best polarized sunglasses on the market. The sharpness of the ZEISS lenses is second to none. I mean it; they’re insanely clear. In fact, the world looks so much better through these lenses that I deem it 100% acceptable to wear these babies inside. And in the rain. Maybe even at night. The first thing I noticed when I tried on the Typhoons was the shape. It’s a bit like wearing the sunglasses equivalent of a panoramic window. Except, you know… On your face. The lenses are wider than most, which basically gives you a much better view of your peripheries than any other watersports sunglasses would. And thanks to the fact that they’re nicely curved, they still fit perfectly. Hydrophobic coatings help repel water and sweats, but are also anti-static, making it harder for dust particles to setup camp on your lenses. You know what used to bother me like crazy? When I’m out riding my kite and edging super hard, I end up being blinded by the spray coming off my board- which is definitely not ideal. The lenses on the Typhoons have hydrophobic and oleophobic coatings, which prevent water droplets from sticking to (and staining) your lenses while you’re out on the water. Not only does the water run right off and leave you with clear vision one second later, you’ll also be spared the awfulness of having splotchy, stained lenses afterwards (though you’ll still need to rinse them down after your saltwater session if you want to keep them in good nick). If you have a look at the area just above and below the lenses, you’ll see there are some small vents, which the designers especially placed there to prevent fogging and keep a nice airflow going through. I speak from experience when I say this is way more important than just an ‘added extra’; I absolutely hate when the edges of my glasses start to rub against my skin because it’s getting hot and sweaty. Yuck and also ow. But my absolute favorite thing about the Typhoons? The leash. The Typhoons have a sophisticated leash with a retainer system that- in their own words- prevents loss 100%. We’re a bit more nuanced on that, as we know some of you like to push their limits freestyle wise, especially younger kitesurfers and windsurfers. i mean, if really today is the day you decide to learn your first kite loops and it’s 40 knots out there, then it might be a smart thing to just leave these awesome shades in their cosy little case, just this time. For any other day, you’ll be just fine! If you’re really looking for the best watersports sunglasses on the market- and that means premium quality, long lifespan, great design, and top of the line functionality- the Typhoons are for you. The Typhoons are unisex and come in a wide range of colors (pink if you want to embrace your girly side, electric green if you’re prone to misplacing things, and a mix of black, white, and gray for those who like to rock a classic look). They’re also available in a smaller size for Asians, girls, or anyone with face on the littler side. If you love everything about the Typhoon but can’t quite swing the budget for the full monty, the Surge is an amazing alternative. These shades are packed with the same features as the Typhoons, but they’re half the price. Ooh, that got your attention. Unlike the Typhoon, the shape of the Surge frames are slightly more angular and provide less face coverage- which is actually a really good thing for smaller faced people. Particularly on certain girls, the Typhoon can look a little on the big side- and while LiP did bring out the smaller sized Typhoon Up, they still cost quite a bit. Overall, the Surge is a great budget-friendly alternative. The Surge watersports sunglasses are fog-proof, scratch resistant, and protect 100% against UVA & UVB rays. The lenses also have hydrophobic and oleophobic coatings, so if you’re getting sprayed and splashed like mad out on the water, you’ll still have clear vision at all times. The Surge also has a leash and retainer system, which is designed specifically for adrenaline sports athletes- like kitesurfers and windsurfers- who not only ride around at high speeds, but also tend to have some pretty spectacular wipeouts. Again, no more losing your shades on the water. It’s mainly down to the lenses. The Surge lenses are polarized, but they’re not made by ZEISS like the Typhoons are (if you’re used to wearing the Typhoons, you’ll notice the difference). That said, they still provide excellent protection from the sun, spray, and glare on the water. On top of that, they come with their own hard carry case and microfiber cleaning cloth. They’re available in 6 different colors (red and green for the flashy among you, and various greys and blacks for a more classic look). If you’re looking for a budget-friendly pair of shades that you can wear on the water while staying protected from the sun and the spray, the Surge are definitely the best watersports sunglasses for you. From the quality of the frames and lenses to the attention to detail that’s clearly gone into every aspect of the design, LiP watershades are a must-have in our books. I think the thing that sets them apart the most is the fact that the whole team is made up of watersports athletes and enthusiasts; people who know the needs of the watersports world inside out, and who’ve shown they’re willing to go above and beyond to create something special. On top of that, their customer service is absolutely exceptional- so if anything happens to go haywire with the shades that you buy, you can rest easy knowing the LiP team have your back. If you ask me, LiP watershades set the bar for what the best watersports sunglasses should be. But don’t just take my word for it; give them a try! Thinking about buying a pair of LiP watersports sunglasses but still need some advice? Leave a comment in the section below! Eager to connect with like minded nomads? Join our exclusive facebook group and meet the community! Secondly, because the shape of the Typhoons offers a lot more coverage than many other watersports sunglasses so your eyes will be as protected as possible from spraying water (as well as UV rays) which will be beneficial if you decide you prefer to keep your contacts in. They also have a nice little rim underneath which serves as an extra level of protection from the water. I’d recommend giving them a try! If you’re unhappy, their customer service is excellent and I’m sure will be happy to do whatever it takes to make sure that you’re satisfied.